It has been a long time since I did a post on the physical exam. For those who have not read them, I have done a series on the nuances of a physical exam from the perspective of one who has done them for 20+ Years. For those of you who were relieved by the fact that I wasn't doing these any more, I offer you my sincerest apologies. "I didn't hear anything abnormal in the lungs with my stethoscope"
The chest exam is generally, in fact, the lung exam. Since breathing is something I recommend all of my patients do, I am always interested in listening to the lungs. I want to make sure there are no signs my patients will stop performing this activity. But before we go to the lung exam, let me touch on the other part of this exam. The outside of the thorax is referred to as the chest wall. It is always important to have good walls. Walls keep bad stuff out, and walls keep good stuff in. Like the walls of ancient cities, walls protect those within from nasty invaders. The more precious the thing inside, the higher the walls. There isn't much in your body more precious than your heart and lungs. Your chest wall is made to withstand the onslaught of pokes, punches, nunchucks, and other foreign invaders that try to get in and cause havoc. The ribs give strength and support, while the space between the ribs, the intercostal space, gives the chest the ability to expand and contract. The intercostal space is often mistaken for the intercoastal waterway, which is a waterway along the Atlantic coast of the US, allowing people to safely go by boat from New Jersey to Florida (a very common migration pattern during the winter). While the intercoastal waterway plays a vital role in the economy of the Sunshine State, it does not expand and contract with breathing, nor is it flanked by ribs on either side. The main bad thing that can happen to the ribs is a fracture. Broken ribs, while very painful, are not treated with anything other than pain medications. It is not feasible to put a cast on a rib fracture, and the intercostal space serves to splint the broken rib quite well. The one exception to this is a flail chest, where several ribs are broken in more than one place. This causes the segment between the fractures to pull in when a person inhales, and can cause significant breathing problems. The main bad thing that can happen to the intercostal space is for people from New Jersey to try using it to get to Florida. A rib fracture is diagnosed on physical exam by the clinician pushing on various parts of the chest wall and saying, "does this hurt?" When the patient either curses or tries to physically harm the examiner, the rib fracture is confirmed. Rhonchi - a rattling or rumbling sound, kind of like a garden hose when the water has just been turned on. Rales - a crackling sound, like when paper is crinkled. Wheezes - a high-pitched whistling sound made on exhaling. Transmitted breath sounds - sound a lot like rhonchi, but they come from above the vocal cords (i.e. a head full of snot). Rub - a soft brushing sound, like when sandpaper goes on wood. Loud screaming - the sound most pediatricians hear on the chest exam. Rhonchi are present when there is excessive phlegm in the larger airway tubes leading to the lungs. They tend to happen with bronchitis, which defined as: a condition that causes lots of phlegm in the large tubes leading to the lungs. Bronchitis is not usually caused by bacteria, and requires antibiotics only a small percent of the time. Rales are present when there is fluid in the lungs themselves. This is either caused by infection (such as pneumonia) or the backing up of fluid in heart failure. Rales are generally not good. Wheezes are the cardinal physical exam sign for asthma. They occur when the medium-sized airway tubes are inflamed and constrict, making it easier to breathe in than out. Wheezes also occur in the pediatric condition known as bronchiolitis, usually caused by the respiratory syncytial virus (RSV). Louder wheezes are actually often better than softer wheezing, as the latter may be a sign that not much air is able to get out. In general, the longer it takes for a person to exhale, the worse their problem is. A Rub happens when the sack that surrounds the lungs, called the pleura, becomes inflamed. 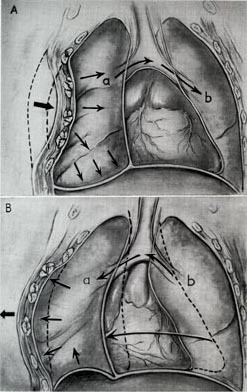 The job of the pleura is to allow the lungs to expand and contract smoothly without sticking to the inside of the chest wall. When it becomes inflamed, it is called pleurisy. Pleurisy is usually caused by a virus, and feels like someone is stabbing you in the chest with a pencil every time you take a deep breath. If you think you may have pleurisy, first check to see if someone actually is stabbing you with a pencil. That condition is known as annoying little brother syndrome. Rubs are difficult to hear, and are a handy way to make medical students feel stupid. This is done when the resident or attending physician listens to the chest and says: "if you listen carefully, you can hear a rub." The students listen and only hear normal breath sounds and the distant chuckling of the teaching physician. The student then pretends to hear it clearly, saying something like: "wow, that's the best rub I have ever heard." This causes the humiliation to be passed on to the other medical students in the room. Decreased breath sounds happen due to a decreased movement of air. This can be due to a problem with the lung itself (such as emphysema), or the pleural space (such as as a fluid collection, or an effusion, and a collapsed lung, or pneumothorax). A pneumothroax happens when air gets in the pleural space surrounding the lung. This can happen from trauma, illness, or can just happen spontaneously. Collapsed lungs are quite painful, and often require a tube being placed in the intercoastal waterway intercostal space, called a chest tube. You don't ever want to get a chest tube if you can help it. They hurt like heck. Percussion - this is where the examiner places one finger on the chest and taps it with the other. The resonance of the "thump" can sometimes give clues to diagnosis. Some physicians just like the rhythm. Tactile Fremitus - this is where the hands are placed on both sides of the chest (on the back!) and the patient is told to say "Ninety-Nine." If the vibration of the chest is decreased, there may be an effusion present. This also serves well in confusing the patient. Egophony - Egophony is elicited when the examiner places the stethoscope on the chest and tells the patient to say the long "E" sound. In normal lungs, the E sounds like "E." If there is fluid on that part of the lung, the E sounds like "A." This also confuses patients. Whispered Pectoriloquy - This technique is performed by the examiner having the patient whisper "Ninety-Nine" while listening to the lungs with the stethoscope. If there are problems with the underlying lung tissue, the whispering will be much louder. By the time you are doing whispered pectoriloquy, the patients ask to see your medical license. The origin of the use of the word "Ninety-Nine" in these techniques is not well understood. Many have suggested other words. Toward the end of the millenium, some progressive medical schools were instead teaching the students to have patients say the lyrics to Prince's popular song, "Tonight I'm going to party like it's 1999." Most of these techniques are seldom used in our country. It has been replaced with a more effective procedure: filling out a chest x-ray requisition. That's about all I have to say about the lung exam. It really is a quite important part, with many visits of patients to the office centering on problems related to breathing. Now, before you go to another web site, I want you to put your hands on your computer monitor and say "Ninety-Nine." Thanks. That helped a lot.